It’s no secret that a beautiful lawn starts with recommended fertilizing schedules and weed control. Knowing when to fertilize and what products to use, along with identifying the types of weeds you are dealing with in your landscape, are crucial. Calling in a professional lawn care company in Atlanta is a great first step. The state of Georgia is known for its lush, green landscape. But there are also species of plants that invade and can take over and kill your grass, shrubs, and ornamental plants and trees. Mulberry weed, Japanese honeysuckle, English ivy, and mimosa are just a few examples from a long list of invasive weeds that must be controlled if you ever hope to have that picturesque green lawn you’ve dreamed about. One of the most common weeds is crabgrass. This creeping grass sprouts in the spring and summer months around the Atlanta region. Unlike some of the other weeds that pop up on local lawns, crabgrass doesn’t harm your turf. You may see it sprouting along the edges of your sidewalk or driveway or through cracks in the cement, or it may show up in your ornamental beds. The problem with crabgrass is that it’s opportunistic. Mow your lawn too short or water too much, and it will start to grow in any bald or thinning part of your yard. According to professional lawn care services in Atlanta, applying a preemergent herbicide will prevent any of the crabgrass seeds from germinating. If you see crabgrass emerging, it’s too late for a preemergent, and a post-emergent should be applied. For ornamental beds, mulch is an excellent deterrent. A healthy lawn prevents unwanted weed growth, and you can also prevent crabgrass by promoting a healthy lawn. Regular fertilizing will thicken your grass, and help it resist crabgrass invasions, as well as other threats like pests and disease. 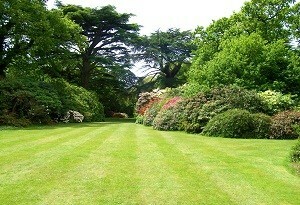 But to be effective, the correct fertilizer must be applied in the right amounts, at the right time of year. Understanding what lawn care treatment in Atlanta works best is an important part of achieving the perfect green landscape. Out of every 4 adults in the U.S., 3 of them have a home with a lawn or landscape. In the Atlanta area, a healthy, lush lawn adds to a home’s curb appeal and to the overall value of the home. For many residents, it is a matter of pride and a part of the culture in Georgia for their home to be surrounded by beautiful trees, manicured lawns, and a variety of ornamental shrubs and colorful flowers. One way to ensure your yard is ready from one season to the next is by hiring a locally owned lawn care service to handle your fertilizing, weed control, and landscaping needs. 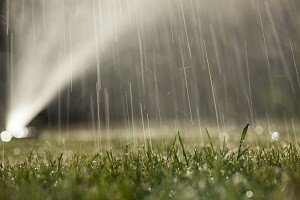 For more information about our available lawn care services in the Atlanta area, please browse our website.